American Prairie Reserve’s hut system provides visitors with a base camp from which to explore the Reserve. In the tradition of other hut systems around the world these huts offer comfortable and affordable accommodations in spectacular settings. The Founders and John and Margaret Craighead huts consist of two 30-foot yurts connected with a hallway and accommodate 9 people in 4 bunkrooms. Three rooms have 2 XL-twin beds, one room has a twin bunk and XL twin. The living yurt contains a fully-equipped kitchen, dining area, a library, and interpretive displays. Solar panels power LED lighting, a refrigerator and an outlet for charging cell phones/camera batteries. A propane stove and solar air-conditioning unit provide heating and cooling in the living yurt. A third yurt contains a composting toilet and a changing area. Guests bring their own sleeping bags, pillows, groceries, and supply of water for drinking, cooking, and washing dishes. Non-potable water is available at the ranch center (marked with an "i" on maps). Similar to U.S. Forest Service rental cabins around the western United States, American Prairie Reserve’s huts are self-service facilities. We depend on users to take good care of these buildings and leave them clean for the next group. For those who’d like a full-service option – including meals, sleeping bags, and guided tours – please contact our friends at Lewis and Clark Trail Adventures. Custom trips are available for groups of six or more. 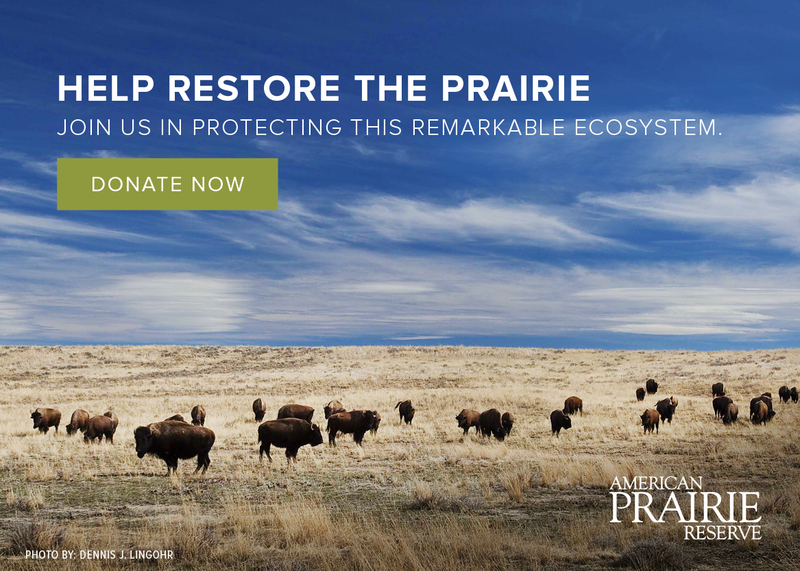 American Prairie Reserve supporters receive a 20% discount. Set in a cottonwood grove near the banks of the Judith River, the John and Margaret Craighead Hut is an ideal base for visitors looking to bike, fish, or paddle on the Missouri and Judith rivers (note: the lower Judith contains cottonwood snags/strainers/portages and should only be attempted by competent paddlers). From April to late October 19th it is possible to reach the hut via 4WD vehicle in dry conditions. October 20th through March (spring date is weather dependent) the hut is accessed via a 1.25-mile walk, bike or ski. All water must be packed in, drawn and treated from the Judith, or melted down from snow/ice (if available). Located high above the Missouri River valley, the Founders Hut has views of numerous Central Montana mountain ranges. Two track roads are ideal for hiking, biking, and winter cross-country skiing. From April to October 19th it is possible to reach the hut via 4WD vehicle in dry conditions. October 20th to December 1 the hut is accessed by way of a 6.75-mile walk, bike or ski. The hut is closed from December to April. The spring opening date is dependent on snow melt and road conditions, stay tuned to this page or check the @apr_info twitter feed for updates.